i just know that my little lego pirate is going to rake in tons of candy this year. there's no way we're eating all of it. but what do you do with it? this post is in no way sponsored or endorsed by Halloween Candy Buyback or Operation Gratitude. I've never heard of this. Very cool! This sounds like a great thing to do. Kids always get too much candy. 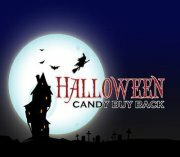 I love the halloween candy buy back. We always have our daughter "trade in" her candy for toys, books and other items. She gets to pick 10 pieces to keep and the rest gets traded in. I've never heard of this! What an excellent idea! What a fantastic idea! Thank you so much for sharing this. I didn't know about Operation Gratitude.